Editor’s Note: This blog contains dates for YTH Live 2016. For dates about YTH Live 2017 abstract submission, click here. Heard the news? Now through October 30, 2015, we’re accepting abstract submissions for YTH Live, the youth + tech + health conference. Got an innovate app, social media campaign, or other technology that improves the health of young people? You’re invited to submit an abstract and share what you’ve learned with the YTH Live audience. First, let’s talk logistics. You need to submit your abstract by October 30, 2015 via the abstract submission form in order to be considered. The YTH Live Program Committee will then carefully review your abstract, and you’ll be notified by December 7 whether your abstract has been accepted or not. The format of your abstract can be as creative as you’d like, as long as it follows our formatting guidelines and meets the evaluation criteria outlined in the Call for Abstracts. I’ve presented at YTH Live in the past and want to share some tips that can help you to submit a successful abstract, too! Abstracts for YTH Live need to be 250 word or less, so keep it simple and concise. For a successful abstract you should articulate how your work relates to each of the youth + tech + health fields—not just one or two of those! For my YTH Live 2015 presentation on Tumblr feminism, I wrote learning objectives that showed the connection between youth (young feminist activists), tech (the Tumblr platform), and health (eliminating gender-based health inequalities). Keeping your abstract simple and focused on the Y + T + H greatly improves your chance of being selected to present at YTH Live. You might be thinking that the program description for your abstract is the easiest part of the process, but I can tell you from experience that writing a catchy program description can be a challenge. How will you entice the YTH Live community to attend your session in 150 words or less? By making your abstract simple and focused, you’ve laid the groundwork for a winning program description. This is your chance to be creative—feel free to use fun, colorful, youthful, and energetic language to describe your presentation. Avoid using jargon or overly complex language that that can leave people scratching their heads. You want to entice, not confuse. If you have a hard time sticking to five main keywords, it may be a sign that your abstract is too broad. If that’s the case, consider taking a broadly focused abstract and submitting two narrowly focused ones instead. The October 30 abstract submission deadline will be here before you know it. Avoid the anxiety of submitting your abstract at the last minute. I know the submission process can feel intimidating or seem like it will take you hours to complete. But I can assure you it’s neither of these things. In fact, YTH has simplified the submission process and evaluation criteria for abstracts. Try creating a draft of your abstract at least a week before the deadline. You can take advantage of the extra time and have someone else review your abstract and give feedback. I always recommend getting a second look, since others can provide insight that we ourselves may be blind to. After you submit an abstract, make sure to register for YTH Live, even before official abstract acceptances are announced. Early bird registration can save you $50 off the regular rate. This rate is available to a limited number of registrants, so get in on the deal now before it’s gone! We also have special discounts available for adults attending the conference with youth, young people ages 14-21 attending the conference, and students. 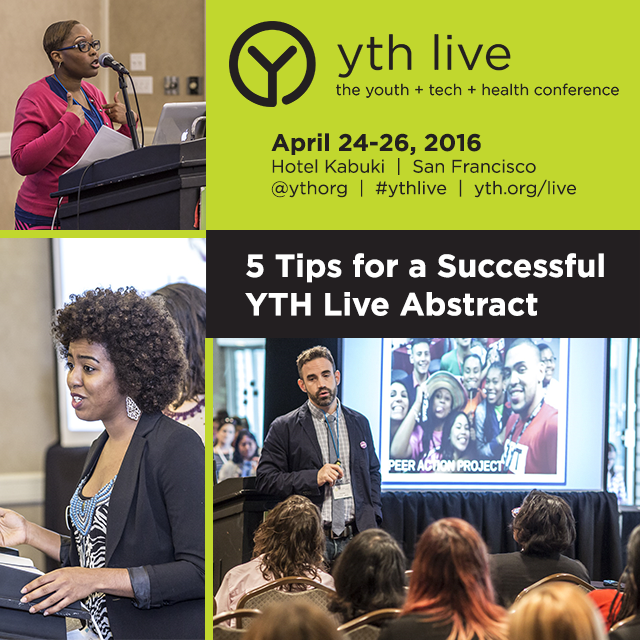 I wish you the best on your abstract and hope to see you at YTH Live on April 24-26, 2016 in San Francisco! Join the YTH Live community on Twitter at @YTHorg and #ythlive. And check out my recap of how young people rocked YTH Live 2015!